As one of the most expensive cities in the world, London might not be the first place you think of for reasonable or free exercise. However you might be surprised at the variety of fun AND free fitness that is available in the Capital. Whether you’re into HIIT, yoga, bootcamp, running or even rollerskating, there are activities available all across London from dawn until dusk. It’s highly likely that you have have already walked past the Adidas #heretocreate studio. A plain black door with ‘152’ emblazoned on it is the only thing that lets you know that this amazing space is there. Perhaps this is for good reason; the Adidas studio has very quickly become one of the big names in free fitness, ballooning its database to over 60,000 women in the UK. You can view and book their female-only classes on a weekly basis using their very friendly bot service on Facebook Messenger. Spaces are all allocated randomly and they let you know on Friday morning if you have a place at any of the sessions for the next week. Ranging from their ‘152 signature’ using kettlebells and sliders for an all round fitness burn, to a calming yoga flow or even a kombucha workshop, there is always an ever-changing variety of sessions and classes to pique your interest. The classes run from Monday through to Saturday, usually starting at 7am until 8:30pm. After your first session expect a 20% discount voucher for the very tempting Adidas shop onsite and make sure you leave enough time to try a delicious post-workout shake or light bite in the Bel-Air cafe downstairs. 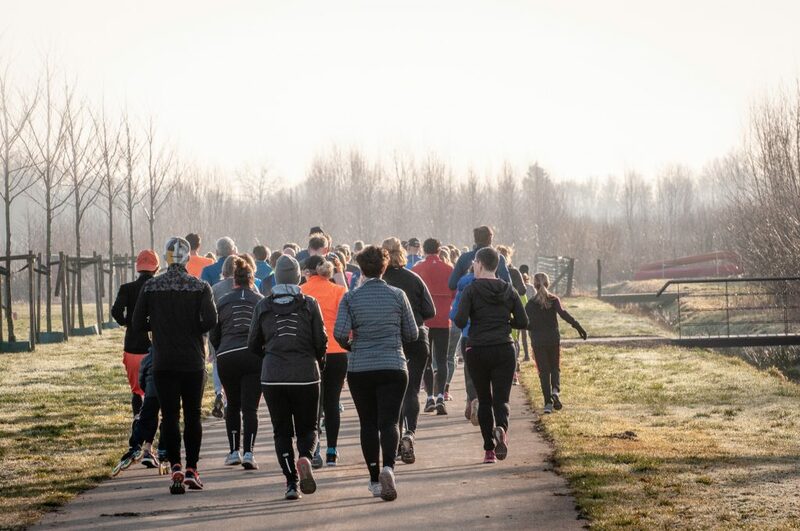 A weekly run club also departs from the studio to take on the more scenic city runs, with distances usually between 3-4km followed by a post-run stretch. There is a 7-8km session at the weekend. Sign up via their website and start enjoying all of these amazing sessions! Luxury sportswear brand Lululemon might not be the first brand you naturally think of when it comes to freebies, however most weekends they offer free yoga and other activities as part of their ‘Sweat with Us’ initiative. With London yoga classes usually ranging in price from £15-25 per session, this is a great way to try yoga out and see if it’s for you before committing to a more expensive class. Their classes focus on all abilities with certain session prioritising different asanas (postures) every week. There’s no need to bring anything either, however make sure you turn up at least 15 minutes before to grab a space on one of their mats as these sessions understandably fill up very fast! If you’re new to London, or if you want to broaden your circle of friends, a running club is a great way to get fit and meet new people. Many running clubs charge weekly or even monthly subscriptions however, there are plenty that offer free sessions that give you a buzz in return. London’s biggest free running club departs three times a week from their very own cafe/clubhouse at 130 Druid Street, Bermondsey. A 5km, 6km or 10km run takes place every Tuesday from 7:15pm, on Thursday evening they host an interval and strength session, and on Sunday two 10km runs take place at 9:30 and 11:30 am respectively. After most of the runs there’s the option to grab a bite to eat or a drink so whilst it’s a great way to get fit, it’s also the perfect opportunity to make like-minded friends. Completely free and for a great cause, Goodgym’s philosophy is to make a difference to the lives of local elderly and lonely people and also to help with local projects. It only takes two weeks to be fully registered with Goodgym (due to the nature of the volunteering a background check is needed) and then you’re good to go, making an amazing change to the local community with every run that you take part in. If you can only commit to one off sessions, they have a group that help complete odd-jobs for elderly people in your immediate area, however if you can offer a more regular service you can join their ‘coach runs’ where you’ll be partnered with an isolated person over 60 who will benefit greatly from a visit once a week during one of your runs. Running brand Asics offer four different running clubs a week in London. Mondays and Fridays, head to their Oxford Circus store for departure at 7pm and then Tuesdays and Fridays at their Canary Wharf store from 6:30pm. All abilities are welcome, however they do run more of an intermediate session on Thursday where a 7km run is planned around the city. Arrive ready to run at the Canary Wharf store (don’t worry, there’s a secure bag drop) and if you’re planning on making the Oxford Circus session they have bathroom facilities and a changing area. If you find yourself frequently using the phrase ‘I don’t have time to run’ then Midnight Runners could be the group for you. Despite the name, they don’t often run at midnight, but instead most of their weekday runs depart between 6:30 and 8:30pm. Tuesday is for their signature run; 10km with five bodyweight exercises, music, and drinks afterwards. On Thursday expect a speed track session and then every Sunday take part in a 15-30km social run followed by brunch. Six-nine times a year they host one of their most fun events: a 10km run in fancy dress, followed by a DJ-led after party. If you enjoy a challenge or you are a keen ultrarunner, then the Midnight2Midnight event could be for you. Over 24 hours 24 10km runs take place on the hour, every hour, and it’s up to you how many laps of this incredible course you decide to run. Your first two sessions at this inspiring run club are free and then membership is only £36 for three months, so it’s definitely at the more affordable end of the scale. If you’re into more unusual forms of exercise then you can still get your free fitness fix with the LFNS club. As the name suggests, every Friday and Sunday (weather dependent) a vibrant group of people take to the streets of London in a marshal-led skate. Accepting both the roller blade and the roller skate, the only condition is that you can turn, stop and control your speed on hills. The Friday night meet-up begins at 8pm and is more of a technical skate with sprints and hills, whereas the Sunday session is family-friendly and suitable for those looking for a more leisurely session where they can chat to other members. A 2000 watt music ‘bike’ that comes along to every skate session provides the playlist needed to create the party vibe that these sessions offer. Just like Lululemon, Sweaty Betty offer free fitness classes at most of their locations across the UK. Classes include bums & tums, HIIT, pilates, pregnancy yoga, barre, outdoor bootcamp and meditation all throughout the week, including weekends. Using their easy booking form, you can select by location or by class, however it’s operated on a first-come, first-served basis with classes being launched a week in advance so be quick if you want to grab a space! If you’re unsuccessful make sure you still sign up to the waiting list as people often drop out closer to the time. They also have a brand new studio space opening up in Carnaby Street later this year where even more cutting-edge free fitness will be taking place, and with Farm Girl and Duck & Dry on the first floor, you can smash a great workout, re-fuel and get an exclusive Sweaty Betty blow dry all within the same space. If you would rather workout for free in the comfort of your own home, we have just the property for you. Developments such as Embassy Gardens, Royal Wharf, New Providence Wharf and London City Island all have cutting-edge fitness suites and gymnasiums onsite, so if you’re looking for a new home to buy or rent, check out all our new developments here. If you know of any other amazing free fitness available in London, do get in touch via Twitter!